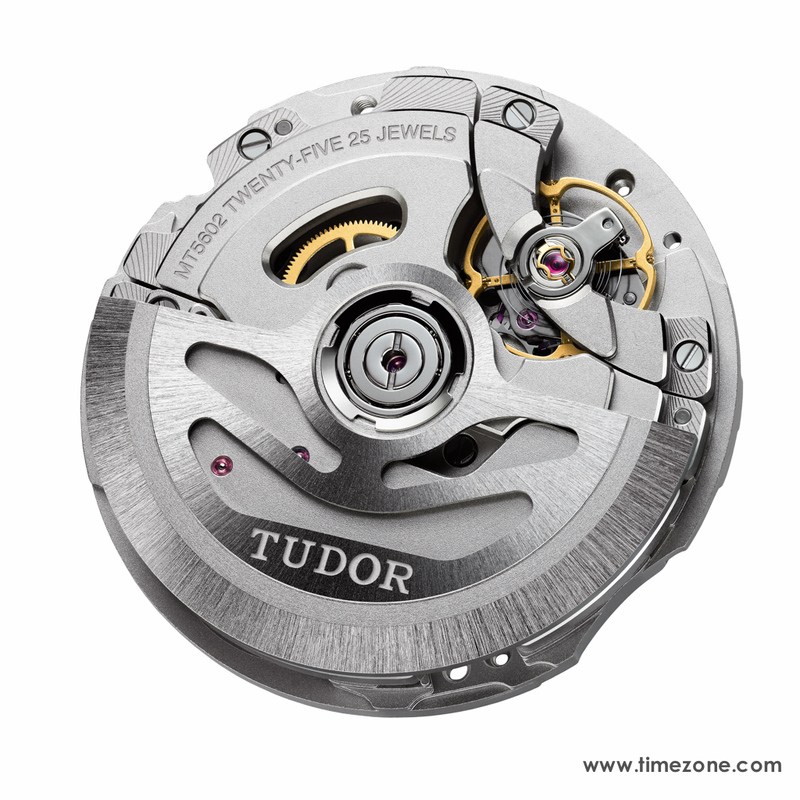 For 2016, Tudor continues to roll out new in-house manufacture movements distinguished by the "MT" code that stands for "Manufacture Tudor". Coinciding with this in-house movement rollout is that the Tudor shield logo is replacing the Tudor rose on the dial of all the new Black Bay models going forward. 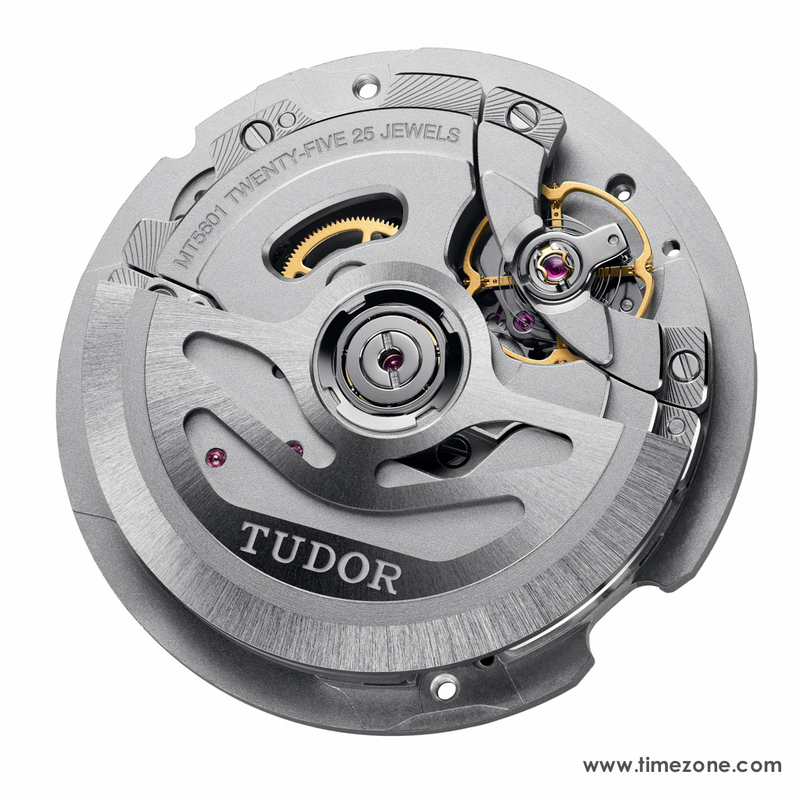 The move from ETA to the in-house Tudor movement adds a very reasonable $275 to the retail price. 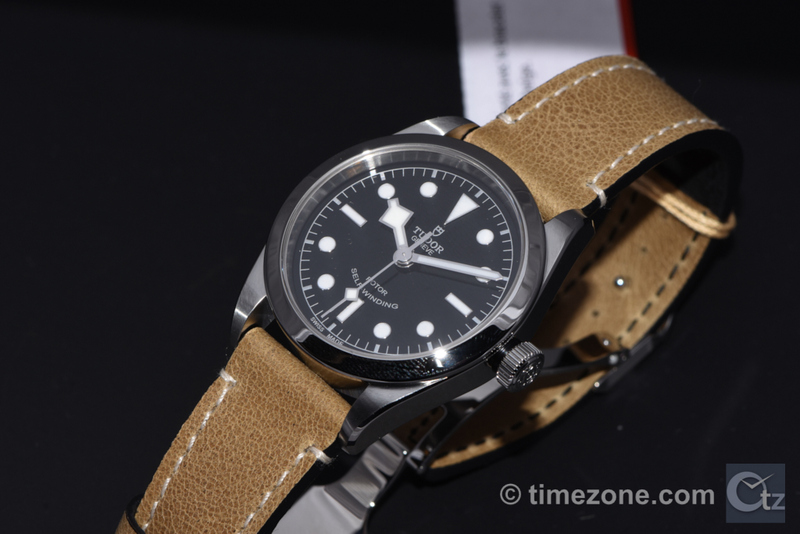 Also new this year is Tudor's expansion into new case materials like bronze and black PVD. Meanwhile, Tudor maintains a strong connection to its past by identifying the historic uses of its watches, then reinterpreting them in its latest models with thoughtful finishing details such as domed dials, domed crystals, pinhole lugs, a prominent winding crown made famous by the ref. 7924 Big Crown, an historical nod to its rivet bracelets, and even the period-correct styling of its jacquard fabric straps. 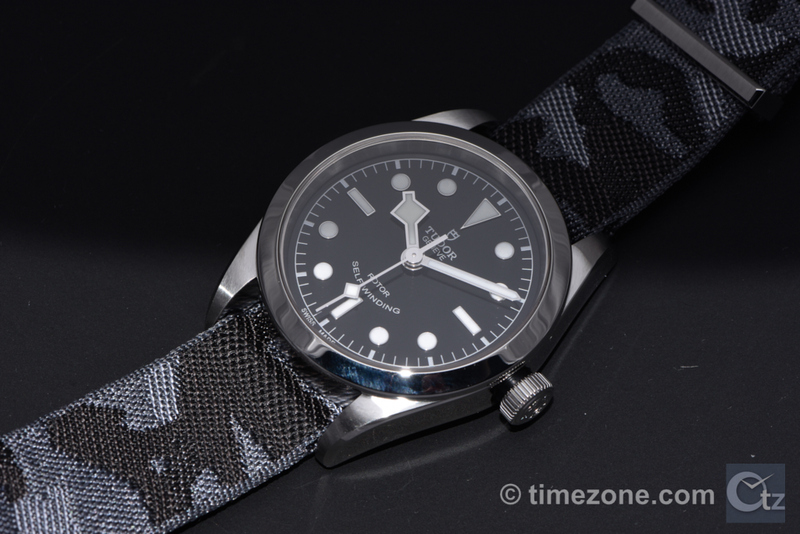 Historically, Tudor delivered basic watch heads to the military with no strap or bracelet attachments so that the cases could be quickly inspected for authenticity. 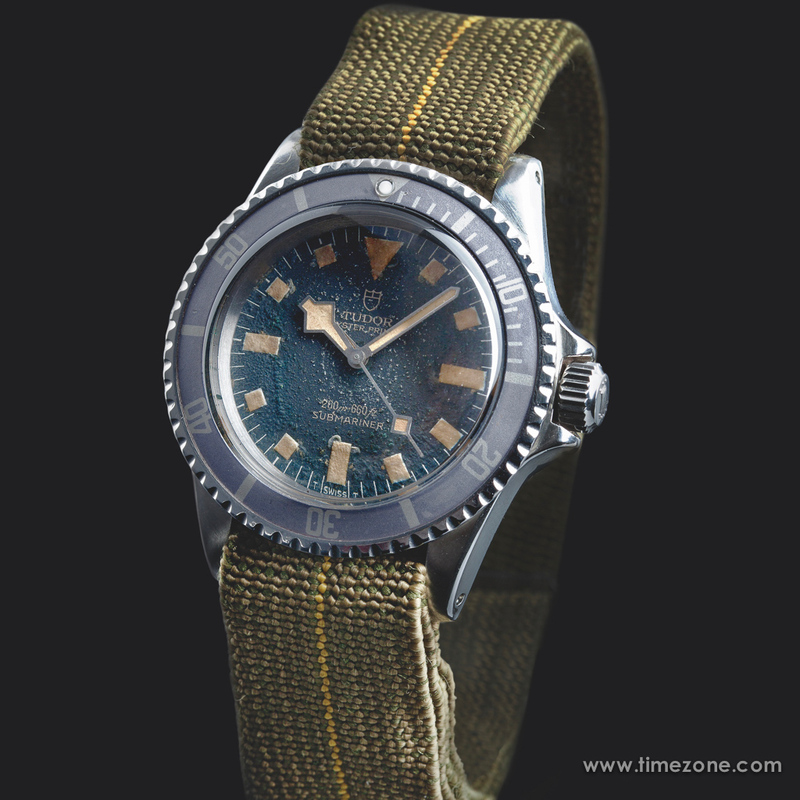 During the 1970s, Marine nationale française (French National Navy) divers used the elastic from their parachute belts to make watch straps. 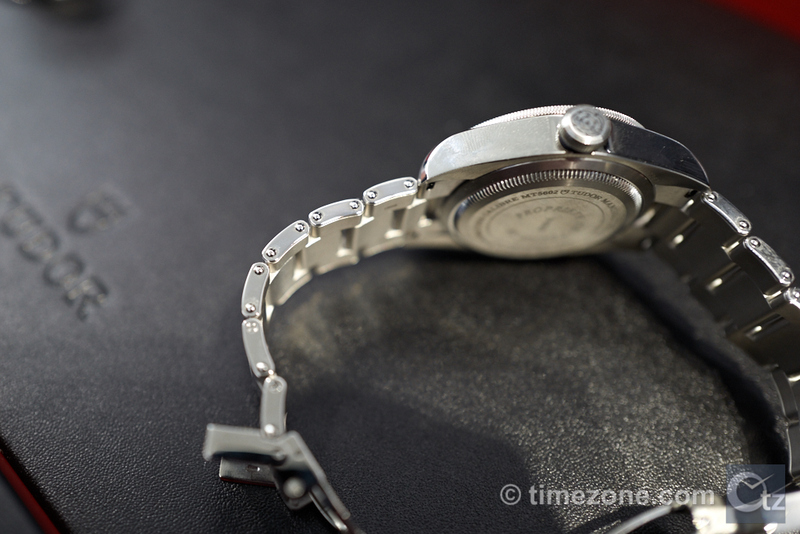 The elasticity of the material made the watch comfortable to wear and easily adjustable over a diving suit. Tapping into this history, this year, Tudor presents its Black Bay Bronze with a period-correct jacquard fabric strap woven in beige, brown and a central yellow stripe. 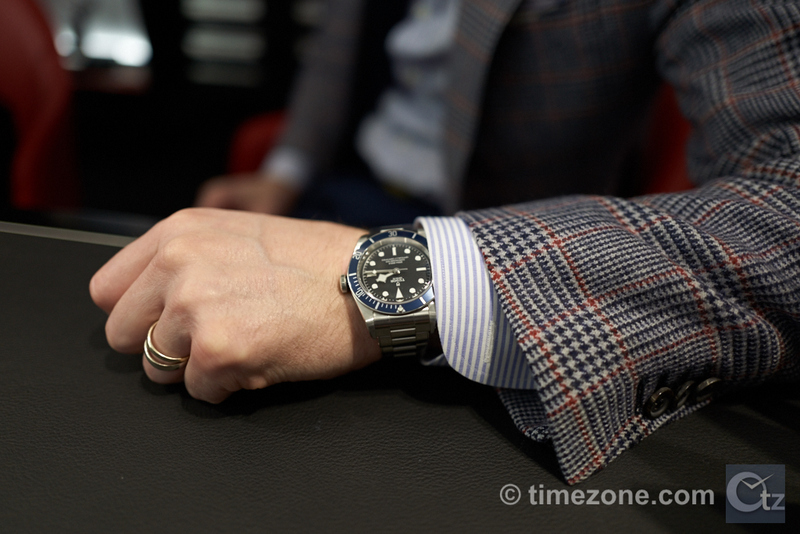 One of my favorite watches from Baselworld is the Black Bay Bronze. Distinguished by its 43mm bronze case, the Black Bay Bronze is made from a proprietary aluminum-bronze alloy with a brushed satin finish. Even the crown and bezel are bronze. The case looks entirely different than in press photos as it starts almost brass. From there, the case material quickly reacts and develops a patina unique to the owner's pH, sweat, oils and relative humidity of the owner's home. However, the proprietary aluminum-bronze alloy is treated so that it only patinas to a certain extent and never reaches a toxic level of green. 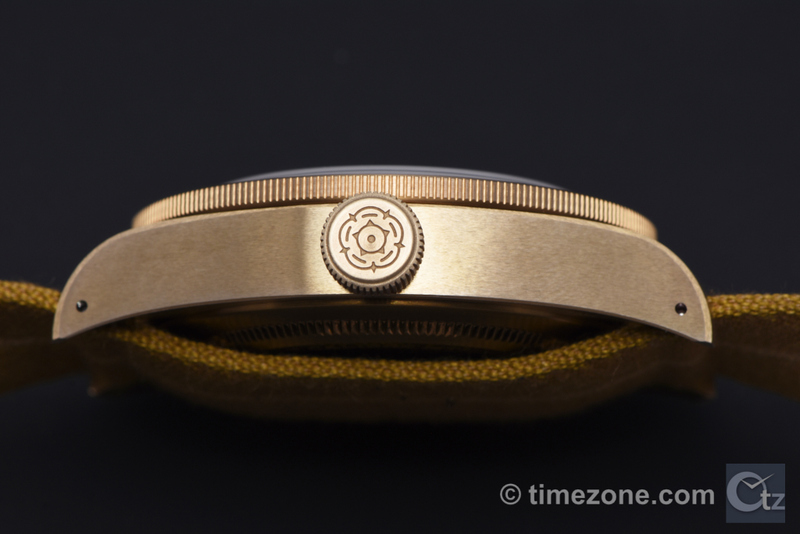 The solid steel caseback is treated with bronze-colored PVD. 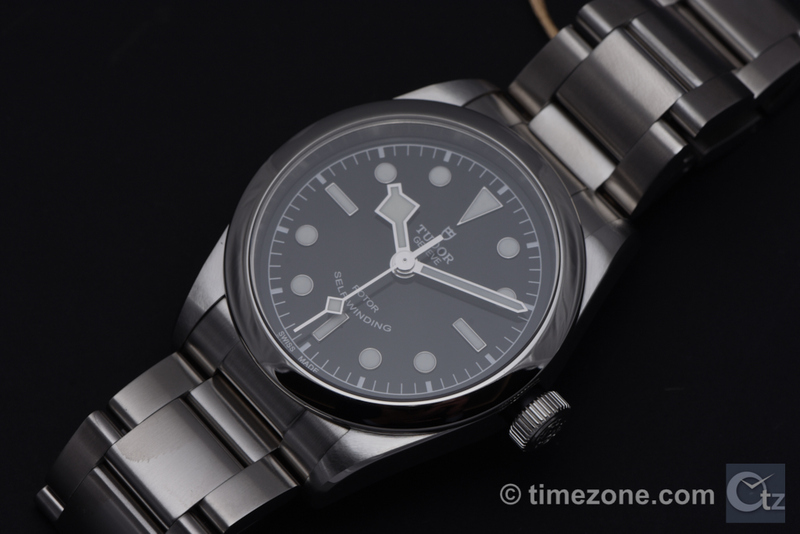 Once the timepiece is brought to Tudor be polished or serviced, Tudor will either return the case to its original state or leave it as is, by request. 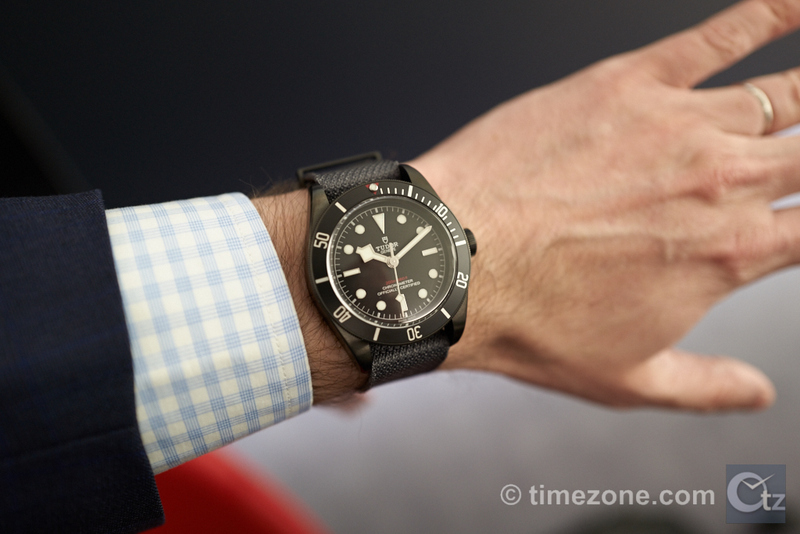 Aesthetically, the 3-6-9 dial configuration is a first for Tudor. From there, the Black Bay Bronze draws inspiration from Tudor's history, with its the general lines, aluminum bezel, domed brown dial and domed sapphire crystal all inspired by Tudor's first diving watches. It features an oversized crown engraved with a Tudor rose, as well as snowflake hands fitted on Tudors used by the French National Navy (Marine nationale française) in the 1970s. The drilled pinholes on the side of the lugs are also key design features inspired by Tudor's history. 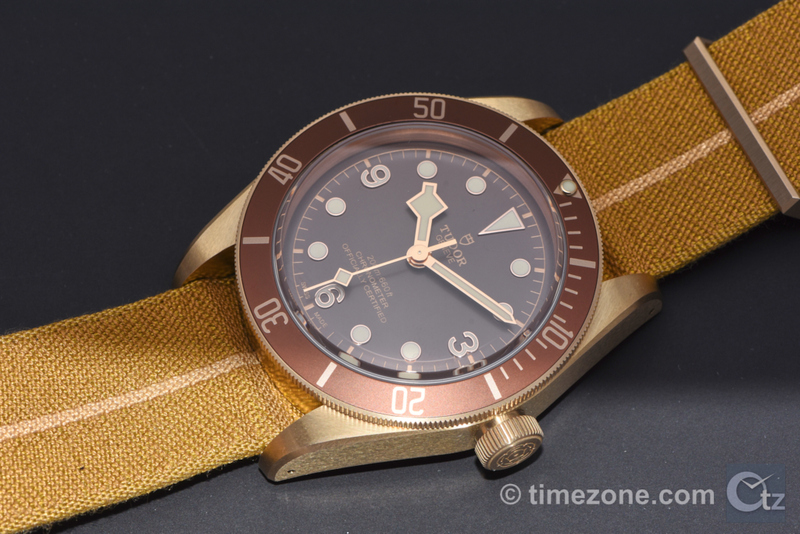 A careful detail aimed squarely at the hearts of watch collectors is that rather than fitting a base caliber and using an insert-ring or spacer to fill the larger 43mm case, Tudor developed the slightly larger in-house caliber MT5601 specifically for the Black Bay Bronze in order to completely fill the case. To achieve this, Tudor started with a larger baseplate, then developed, manufactured and assembled in-house the MT5601. The caliber MT5601 is a 25-jewel, robust chronometer movement (COSC-certified) with a frequency of 28,800 bph (4Hz). The movement is regulated by a variable inertia oscillator with silicon balance spring, held in place by a traversing bridge. The MT5601 delivers an impressive 70-hour power reserve. Delivered with both an aged brown leather strap, and a stylish period-correct beige, brown and yellow jacquard fabric strap woven in France, the Black Bay Bronze delivers a lot of watch for the money and should yield an abundance of satisfaction for all levels of watch enthusiasts. Price is $3,975. 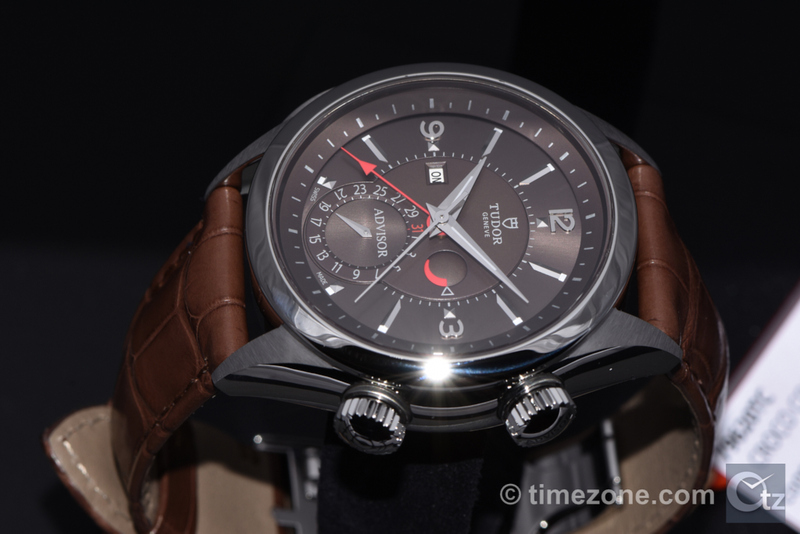 Tudor introduces PVD for the first time to its Heritage collection. As much as I loved the Black Bay Bronze, Felipe seemed smitten by the Black Bay Dark as I caught him trying it on a few times during our Tudor appointment. The Black Bay Dark is distinguished by its 41mm stainless steel case hardened with black PVD coating on all surfaces of the case, bezel, bracelet, deployant clasp, screws and pins. 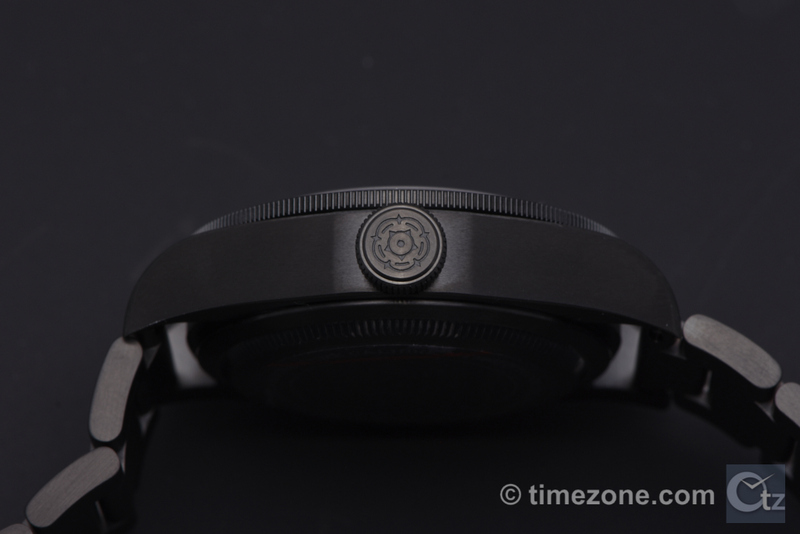 Despite being only three to eight microns thick, the PVD coating results in a dark black color that is extremely scratch-resistant and durable. Since PVD coating takes on the characteristics of the substrate, the Black Bay Dark matte satin finishes throughout the case sides and bracelet reveal the softened grain of the brushed vertical lines. Despite being a coating, PVD appears bonded to the metal and does not reflect light, so there is no annoying glare. Altogether, the PVD is an extremely satisfying surface treatment in both looks and wear, giving the Black Bay Dark the appearance of black military tactical equipment. As part of the Heritage collection, the Black Bay Dark draws inspiration from Tudor's history, with its general lines, domed dial and domed crystal crystal inspired from the first Tudor diving watches. It features an oversized crown engraved with a Tudor rose, as well as angular snowflake hands used fitted on the Tudor watches used by the French National Navy in the 1970s. The depth indication on the dial is engraved in red and the red triangle on the rotating bezel are also nods to Tudor's past. The Black Bay Dark is fitted with the in-house caliber MT5602. Developed, manufactured and assembled in-house, the MT5602 is a robust chronometer movement (COSC-certified) with a frequency of 28,800 bph (4Hz). The movement is regulated by a variable inertia oscillator with silicon balance spring, held in place by a traversing bridge. 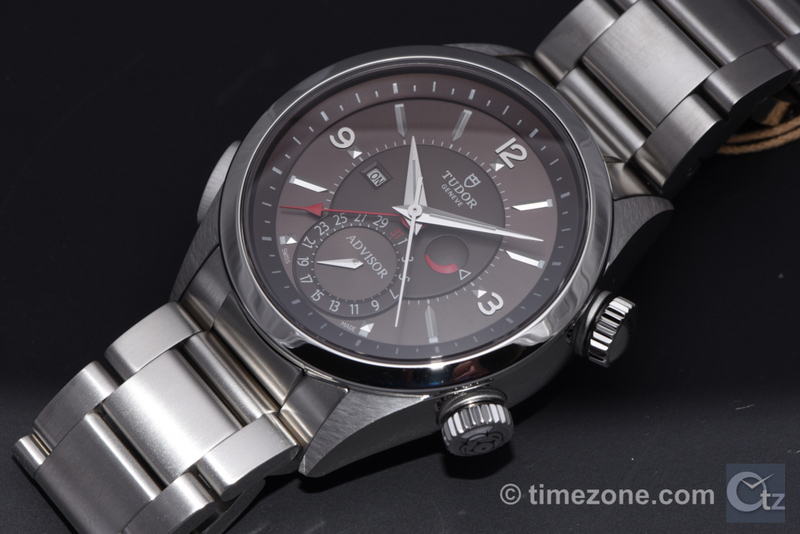 The MT5602 provides an impressive 70-hour power reserve. With a choice of black PVD-treated steel bracelet or an aged leather strap with a black PVD-treated steel deployant clasp, each Heritage Black Bay Dark model is also supplied with an extra anthracite fabric strap woven in France and fitted with a matte black PVD-treated pin buckle. Price is $4,150 on aged leather strap with extra fabric strap, and $4,475 with black PVD steel bracelet with extra fabric strap. The in-house caliber MT5602 is an update to the Heritage Black Bay and, going forward, every 41mm Heritage Black Bay such as the black, dark, burgundy and blue will house the manufacture caliber MT5602. Developed, manufactured and assembled in-house, the MT5602 is a 25-jewel, robust, automatic chronometer movement (COSC-certified) with a frequency of 28,800 bph (4Hz). The movement is regulated by a variable inertia oscillator with silicon balance spring, held in place by a traversing bridge. The MT5602 delivers an impressive 70-hour power reserve. The updated in-house movement is also accompanied by an updated dial, with "Chronometer Officially Certified" now being printed on the new Heritage Black Bay dials. Also updated is the Tudor stepped-down "rivet" bracelet with folding buckle and safety clasp. Influenced by the original ref. 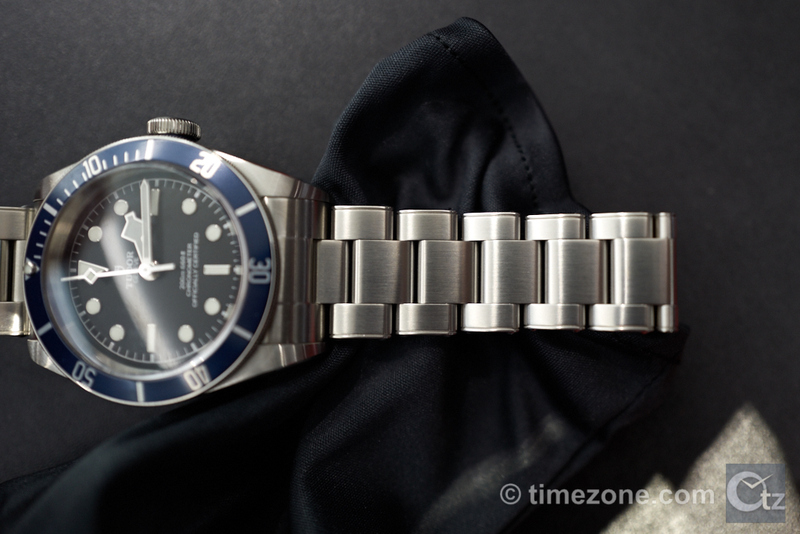 7206 Oyster-type bracelet from 1954, even the current bracelet reference relates back to its origins and is designated as ref. 72060. The ref. 72060 bracelet offers the vintage look of rivet links, but provides the benefits of solid links since the bracelet doesn't stretch. The "rivets" are a laser welded finish to the end of the link pins. The links are not a perfect taper; but instead are staggered and step-down all the way to the deployant. 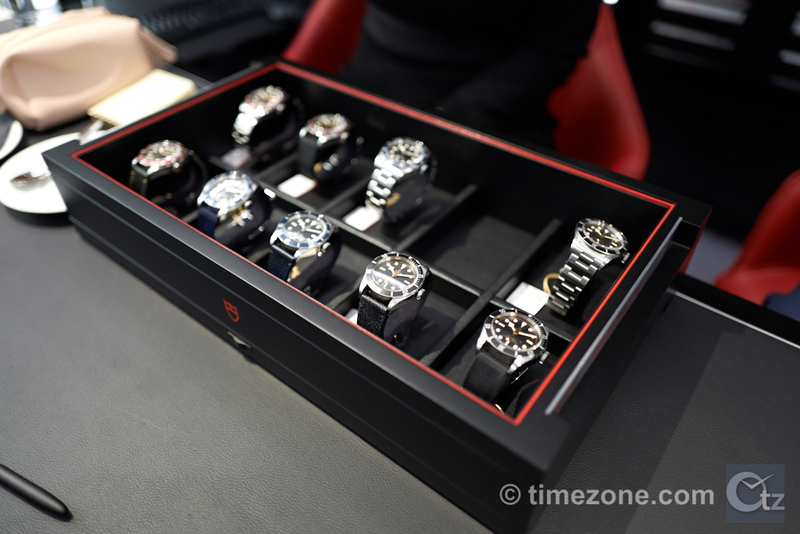 To the mass consumer, these subtleties do not mean much; however, for the watch enthusiast, this type of attention to detail means everything. The ref. 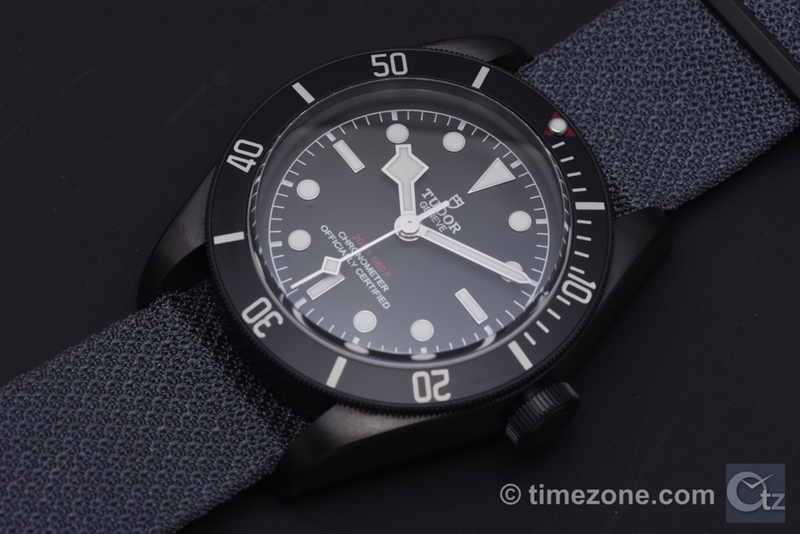 72060 bracelet is available for all the Heritable Black Bay models except the Black Bay Dark. 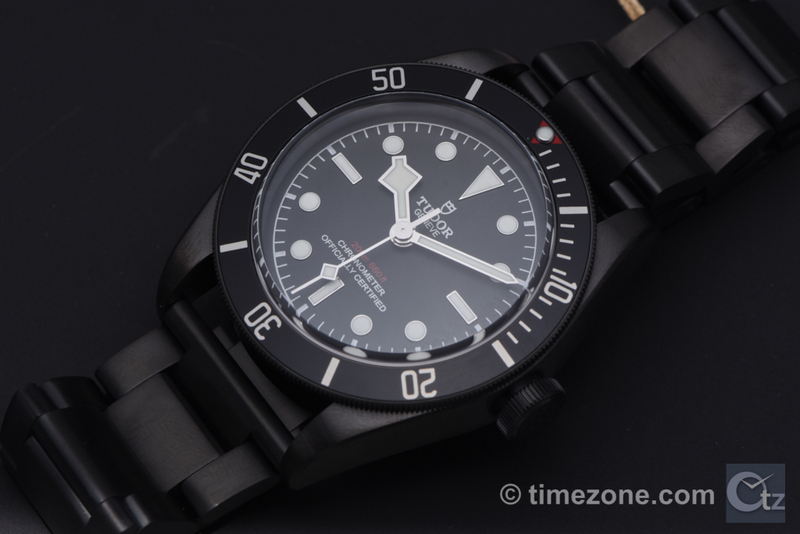 The Black Bay Dark does not feature the welded rivets because they would rub PVD from the surface. The Heritage Black Bay 36 retains the general lines of the Black Bay family in a newly reduced 36 mm model, with a flat sapphire crystal, black polished dial and snowflake hands. Although it has a shield logo on the dial, this year's Black Bay 36 will retain the ETA 2824 movement. With a choice of a steel bracelet or a lightly distressed beige leather strap with steel deployant clasp, each Heritage Black Bay 36 is also supplied with an additional strap in urban camouflage fabric strap woven in France. With its universally good looks and attractive price, after the movement is updated to an in-house chronometer, the Black Bay 36 certainly has the potential to be a contender to the venerable Oyster Perpetual that reigns supreme in the 36mm category. 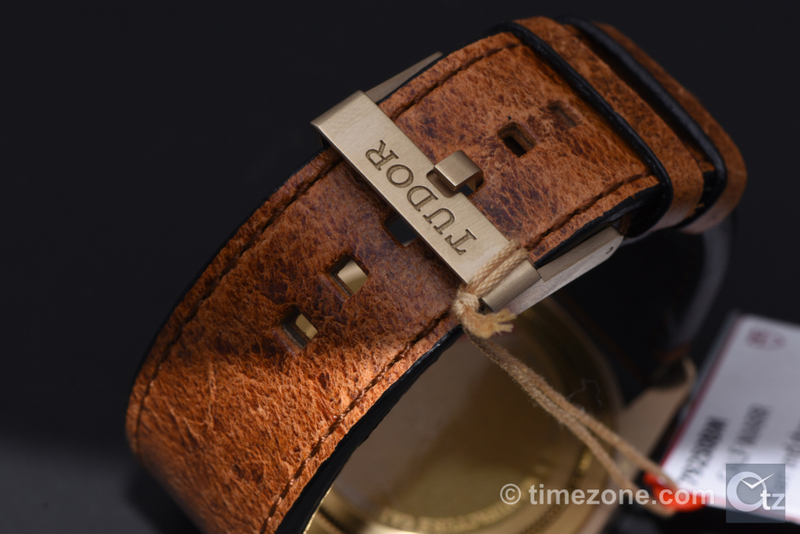 Price is $2,525 on leather with extra camouflage fabric strap, or $2,850 on bracelet with extra camouflage fabric strap. The Heritage Advisor is an alarm watch that gets an updated cognac dial and cognac alligator leather strap. 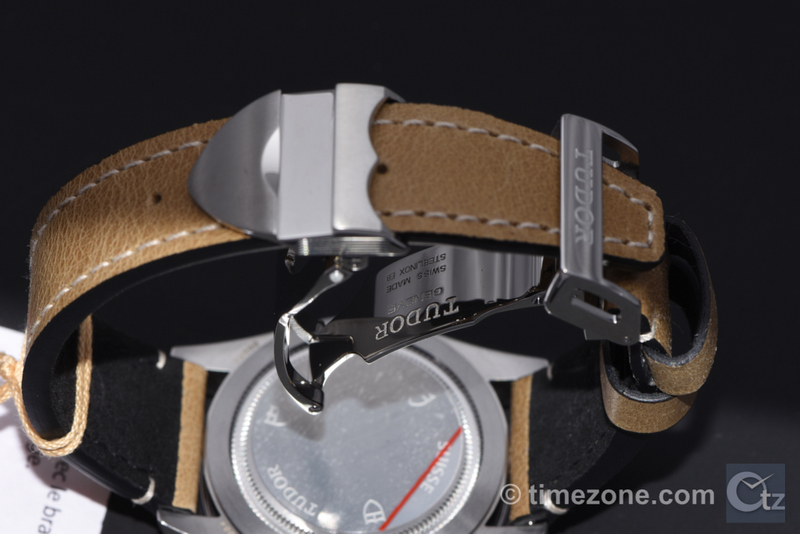 The 42mm titanium case is optimal for the sound quality of the patented alarm. The caliber 2892 automatic movement is equipped with an extra mechanical module for the alarm function. 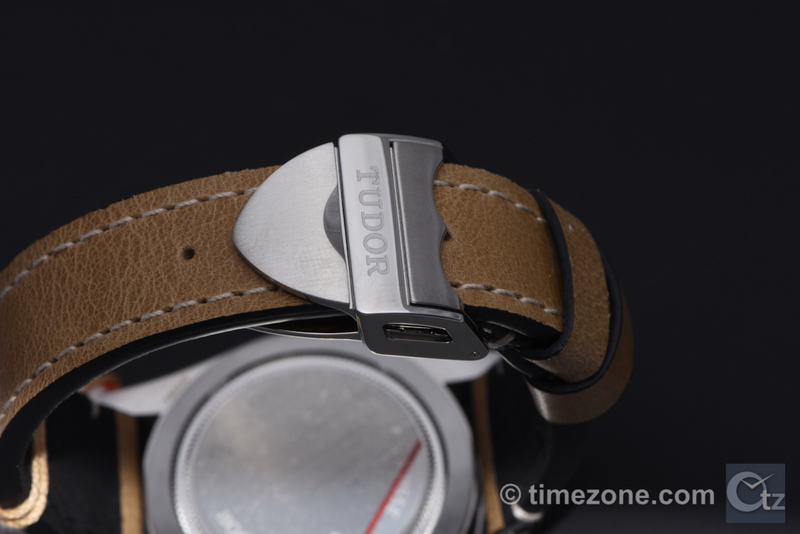 Developed in-house by Tudor, the module gives perfect sound clarity. It also features an alarm power-reserve indicator shown on the dial by a disk at 3 o'clock, as well as an ON/OFF display at 9 o'clock, engaged by a pusher at 8 o'clock. In addition to the hour, minutes and seconds, the movement also indicates the date on a counter at 6 o'clock. 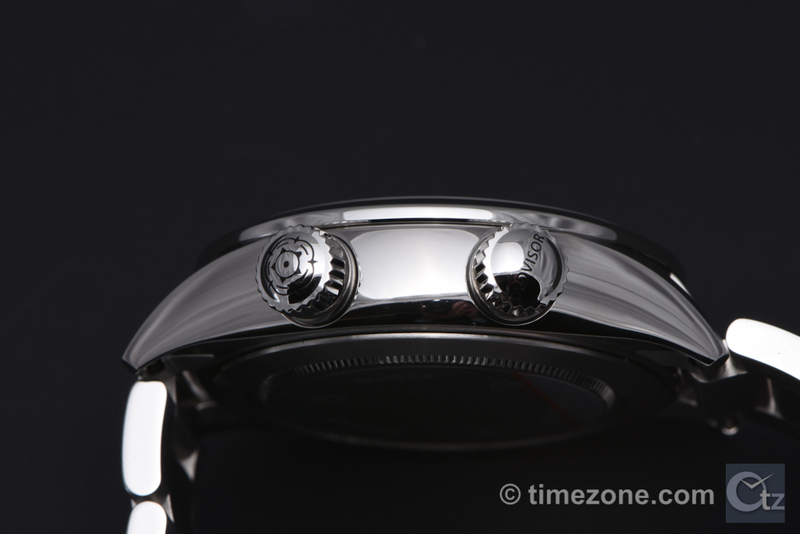 The winding crown at 2 o'clock sets the alarm time (Advisor). The winding crown at 4 o'clock is used to set the time and change the date (Tudor rose). Price is $6,075 on bracelet, and $5,850 on alligator strap. 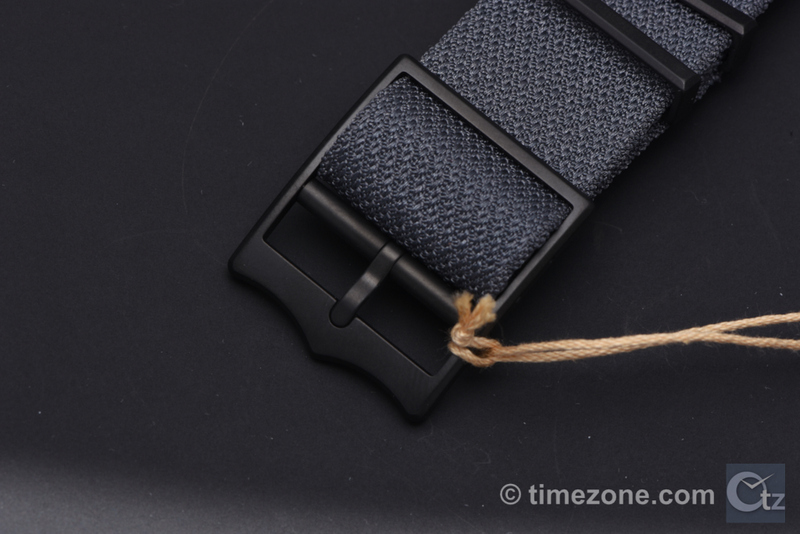 Both models are supplied with an extra black tuxedo fabric strap woven in France. Previous Topic: Haven't heard much talk about this one .....Hey Shark- have a look..